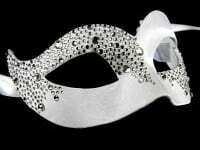 For an occasion piece, the luxury Murano Strass Mask is a beautiful choice. Ornamental macramé lace rests on a golden coloured papier mache base, while Swarovski crystals, faux pearls and beads give the Murano Strass its sparkle – perfect for your masquerade ball, prom or themed celebration party. In cream and light gold, the Murano is designed to complement your masquerade costume and suit your complexion. Lightweight and easy to wear, the mask fastens easily in place around your head with satin ties, and they can easily be adjusted for comfort. Customers come to Simply Masquerade not only for the quality of our real Venetian masks but for the charm and heritage they represent. When people buy from us they have already seen the huge choice of mass produced and machine made copies flooding the market right now but they, like you, want something special. Because, after all, you want to look your best for such a special occasion and your selected theme is Venetian. You want to feel authentic in your choice of costume for your masked ball, prom, black tie event or wedding. Made by hand in Venice, this mask comes with a Certificate of Authenticity. It is individual and, although there may be similarities, no two masks are identical. Since wearing a genuine Venetian mask is important to you, perhaps you would like to hear about the history of the masquerade mask? The mask came to fame during the Italian Renaissance, symbolising the Carnevale di Venezia at which it was worn. The tradition was popular for centuries and the Carnival seemed to last a little longer every year. Today, the Carnival lives on as Venice welcomes 3 million visitors every year at Carnival time to take part in the world-famous social extravaganza. Why not create your own carnival atmosphere and wear a genuine Venetian mask to your special celebration? Order your party mask today and take advantage of free delivery direct to your address.